When iShares isn’t too busy leading the world of exchange traded products, it’s designing new funds to take public. One of its newest launches, the MSCI USA Size Factor ETF (SIZE) could be a winner given its focus as a new, lower volatility mid cap ETF. This new ETF from iShares will track the MSCI US Risk Weighted Index, which includes more than 600 medium to large cap securities with lower risk ratings. Low volatility ETFs have been an extraordinarily hot investment for those looking for equity-like returns without equity-like risk. So far, most have been in the large cap space, which have much more liquid and rational markets. Smaller cap stocks are known for a higher risk-profile and more volatility. Offer wide diversification – The inclusion of 602 equities is no mistake. It’s most comparable to an equally weighted fund (which incidentally, this equal weight ETF has been beating the index handily), seeing as it launched with less than .73% of the fund invested in any one company. Target smaller, but secure companies – Some top holdings in the SIZE ETF include names like Kimberly Clark (KMB) as well as smaller consumer stocks such as Darden Restaurants (DRI). The fund is invested primarily in “boring,” low volatility businesses like utilities and consumer staples. Allow for capital appreciation – Being in smaller companies is a boon during bull markets. Smaller companies are less researched, less followed, and naturally have less efficient markets for their debt and equity issuance. This would be an especially good fund to hold when Wall Street goes on a buyout binge. Other low volatility ETFs invest in large cap stocks, with the PowerShares Exchange-Traded Fund Trust II (SPLV) investing in the least volatile S&P 500 names. 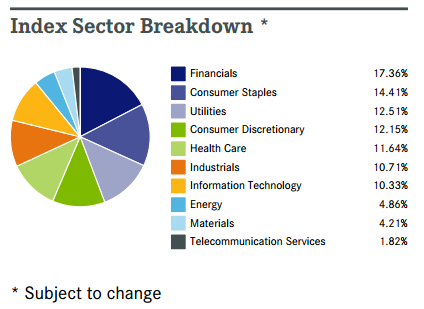 The SIZE ETF from iShares will favor smaller players, with less volatility than the market as a whole. The fund has an average market cap of just under $18 billion, which is significantly lower than its benchmark ($43 billion for the Russell 1000) and the category average ($56 billion), according to data from Morningstar. Whereas the Russel 1000 keeps 20% of its funds invested in mid caps, SIZE has 44% of the fund invested in mid cap businesses. Supporting the fund is a 2.33% historical dividend yield, which is the best in the midcap space. Other midcap funds like the Vanguard Mid-Cap ETF (VO) paid out a paltry 1.28% last year based on current market prices. The iShares Russell Midcap Focus ETF (IWR) paid only 1.68%. iShares’ SIZE yields just slightly less than the 2.8% from SPDR S&P Dividend ETF (SDY), a large cap fund built for yield and current income. Investors who want mid cap exposure with large cap dividends should consider SIZE as a way to capitalize on current income combined with the growth of smaller companies. A low annual expense ratio of .15% makes it more than affordable as a buy and hold position. Investors can enjoy all the upside in mid-sized companies with a current income stream and potential for above-average capital appreciation. Lower volatility is simply icing on the cake. Previous post: Gold is Out – Is the Fear Trade Over?